If you had told me that a co-production between a Chinese animation studio and a Japanese animation studio would be pretty good, I’d have been skeptical. While I have sufficient faith to trust the Japanese animation industry to pump out a true gem at least once a season or two, I can’t say the same about the Chinese side of the industry. And yet here we are. 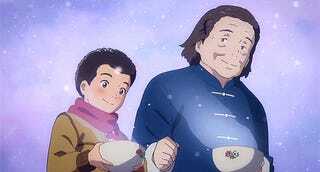 “Flavors of Youth” is a co-production between Haoliners Animation League and CoMix Wave FIlms. While I’m not familiar with any other works from Haoliners, I do know that CoMix Wave Films is home of renowned fimmaker Makoto Shinkai and has been responsible for all of his films and television advertisements. While any art provided for this film by CoMix Wave is easily noticeable, Shinkai himself had no hand in this film. And yet, it feels like an inverse of one of Shinkai’s earliest films, 5 Centimeters Per Second, which admittedly was named as an inspiration for this film. Both 5 Centimeters Per Second and Flavors of Youth are split into three episodes, and both focus on a small group of characters. The similarities however, end there. While 5 Centimeters Per Second follows a boy named Takaki Tohno as he slowly emotionally drifts apart from his childhood sweetheart as the years pass by, Flavors of Youth follows three separate, but small casts as they learn to enjoy the simple pleasures in life. So if 5 Centimeters Per Second is about the tragedy of young love, Flavors of Youth is like a bunch of old home movies that your family made as you were growing up, reminding you of what you once loved. This is the kind of movie that reminds you to cherish every moment with your friends and family, to enjoy your favorite dishes while you can, to do things because you want to do them and not because you feel you have to. Never let life get the better of you and enjoy the simplest of pleasures while you still can. Honestly, I almost cried during the first story because I was reminded of my great grandmother who passed away in 2011. She was 87 years old and outlived my great grandfather by nearly 20 years. Some of my earliest memories are of me sitting at her kitchen table with a large portion of my family, not for any particular holiday, but because it was something we did from time to time. Stories were shared, homemade food made fresh using ingredients from my great grandmothers garden were eaten, and it was always fun and full of love. It was a simple pleasure of my life that I took for granted at the time, and the scenes of Xiao Ming eating noodles with his grandmother reminded me of this, making my eyes tear up. To some viewers, Flavors of Youth could be an average movie, but to others such as myself, it can be so much more than that.